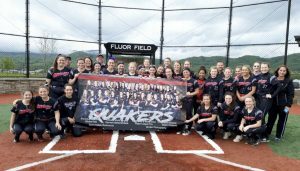 STRUTHERS–The Salem softball team shot out of the gate with 13 first inning runs as the Quakers rolled over Struthers 17-3 on Saturday. Hayden Carner and Jessica Slocum got the Quakers off and running with a pair of first inning homers. It was the first career home run for each of them. Madison Markovich and Elly Exline each added doubles and singles for the Quakers. Taylor Thorpe and Slocum each finished with two hits. Brooke Veglia, Jenna McClish, Meg Rossero and Bailee Thorn all singled. Rylie Troy pitched four innings for the win. The Quakers host Carrollton Tuesday. BELOIT–The West Branch softball team blasted Lakeview in a doubleheader Saturday. The Warriors won the first game 16-3. Delaney Rito, Riley Mesler, Destany Blake and Sydney Mercer all had two hits and three RBIs for the Warriors. Rito and Mercer had triples. Peyton Alazaus was 3-for-4 with an RBI. West Branch won the second game 13-3. Delany Rito led the way by going 4-for-4 with two doubles and four RBIs. Riley Mesler had two triples and an RBI. Sydney Mercer had two singles, a triple and three RBIs. Riley Mesler had two triples and an RBI. The Warriors are now 12-2 overall and host Howland Monday. LV–O. Kelm, lp, (4IP, 2K, 5BB) and Cait Kelm. WB–Ryley Pittman, wp, (5IP, 2K, 1BB) and Delany Rito. LV–Raegan Shick, lp, (5IP, 0K, 2BB) and Mariah Tacket. WB–Ryley Pittman, wp, (4IP, 2K, 1BB), Jenna Rockwell (1IP, 0K, 1BB) and Sam Morris. WELLSVILLE–The Lisbon softball team smashed Wellsville in a doubleheader Saturday. The Blue Devils won the first game 12-0 behind home runs from Autumn Oehlstrom and McKenna Dailey. Mya Emmerling, Kenedy Vrable and Dailey all added doubles, while Kaity Clark tripled. Justyce Vrable homered in the second game as the Blue Devils won 14-1. Clark racked up a double, two singles and four RBIs, while Dailey had two doubles and two RBIs. Emma Smith doubled for the Tigers. The Blue Devils are now 11-0 overall and 8-0 in the Eastern Ohio Athletic conference and host Toronto on Monday. NEW MIDDLETOWN–The Springfield softball team blanked Mineral Ridge in a doubleheader at the MVAC Showcase Saturday at Springfield High School. Springfield won the first game 3-0 behind 12 strikeouts from Jacqueline Kish. Molly Pontius smacked a two-run home run for the Tigers. Marlie Applegarth tripled. The Tigers then won the second game 5-0. Abby Joseph struck out nine for Springfield while also driving in a pair of runs with two doubles and a single. Marlie Applegarth added a pair of singles and drove in three. The Tigers (7-6, 4-4 MVAC) host Sebring Monday. BERLIN CENTER –Western Reserve split a doubleheader with Lowellville on Saturday. The Devils won the first game 1-0 thanks to two singles and an RBI from Jen Heater. Lowellville won the second game, 7-6 in eight innings. Morgan Donithan had a home run, single and four RBIs for Reserve.